Vacuum vapour compression water makers that are simple to maintain and compact to install in any offshore facility. Fresh water is one of the main utilities required on board any offshore facility. Alfa Laval provides a range of solutions for converting seawater into fresh water. Alfa Laval equipment is designed for automatic operation with continuous control and monitoring of fresh water quality. Built using titanium and other seawater resistant materials, the generators feature a simple, compact design that ensures long working life and low operation and maintenance costs. Vacuum vapour compression plants are a simple, efficient method of producing a constant supply of high quality fresh water for both drinking and process use. Using the vacuum distillation process, they convert seawater into fresh water using electricity, but with only minimal power consumption The process ensures fresh water with salinity levels below 2 ppm. The ORCA offshore series covers a capacity range of 20–70 m3/24h. 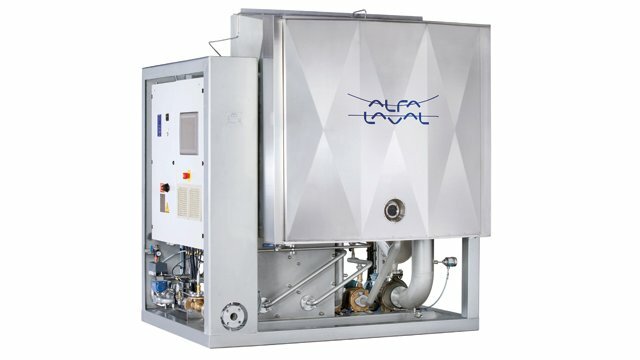 Alfa Laval water makers can be configured to suit any offshore requirement. The ORCA offshore series is optimized for use on board offshore drilling rigs and production facilities. Water maker unit including titanium plate heat exchanger for combination evaporator and condenser, stainless steel distiller shell, air ejector, freshwater pump, compressor, UL-approved control panel with built-in freshwater quality monitoring system. All the above can be pre-piped, pre-wired and skid mounted.